All of our lavatory faucets flow at a rate of 1.2 GPM (gallons per minute), a water savings of more than 0.7 GPM or over 32%. All of our kitchen faucets flow at a rate of 1.8 GPM, a water savings of 0.4 or 18%. These water conserving flow rates go beyond the call of duty in complying with the 2.2 GPM standard mandated by the Federal Energy Policy Act of 1992. All showering end devices (showerheads and handshowers) flow at a rate that is also in accordance with all federal and/or state conservation codes. Most of these showering products may be fitted with flow restrictors that flow at 1.8 or 1.5 GPM - a water savings of 28% or 40% respectively. (Note: Due to continuing water conservation efforts in the state of California, there will be further mandated flow restrictions in the future. As always, California Faucets will be in compliance). More than a third of our decorative finishes are PVD (physical vapor deposition), the most durable and environmentally friendly finish available today. The PVD manufacturing process involves no toxic or ozone-depleting chemicals, which means no hazardous waste to pollute our air or water supply. California Faucets produces the largest selection of decorative PVD finishes in the world. Our fittings are made of high quality, solid brass. Unlike faucets made from inferior materials, which ultimately end up in landfills, brass is highly recyclable. California Faucets manufactures products that help builders meet the Leadership in Energy and Environmental Design (LEED) requirements, which promote environmentally sustainable construction. Use of California Faucets’ products can help substantially reduce indoor water usage and help projects obtain valuable LEED points. 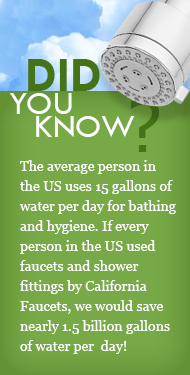 California has some of the country’s most stringent water conservation standards. Now California Faucets has created the first thermostatic system that’s entirely compliant with the California Green Building Standards Code (CALGreen). Our innovative design modifications meet the CALGreen code requirements while still offering the superior features and benefits of a thermostatic shower system, including volume control, anti-scald protection and precision water temperature settings.